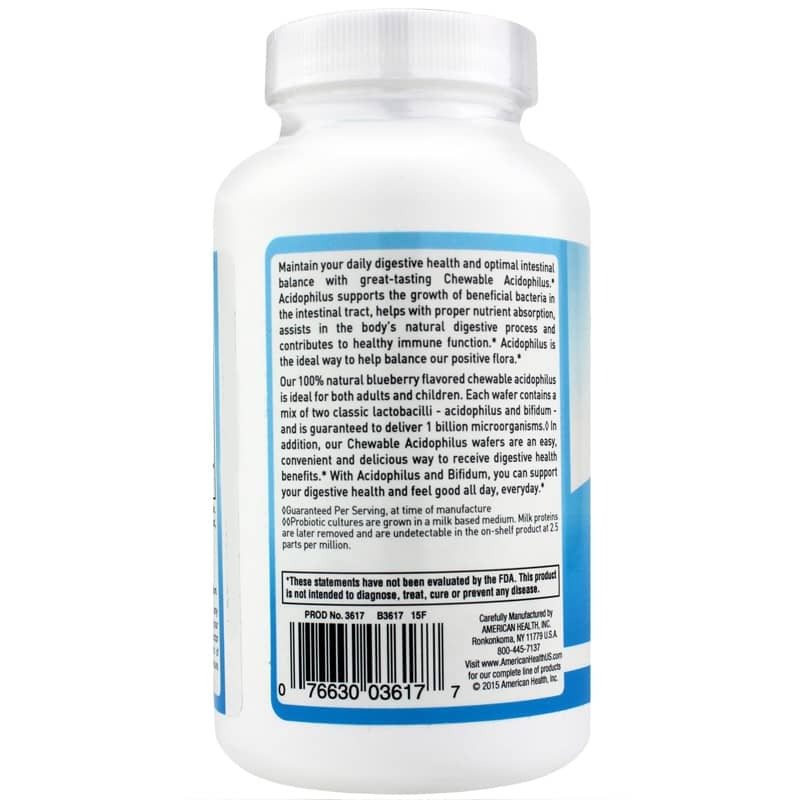 Chewable Acidophilus and Bifidum from American Health is a dietary supplement that maintains microflora balance for normal digestive function. Ships today if you order in the next 14 hours 51 minutes. 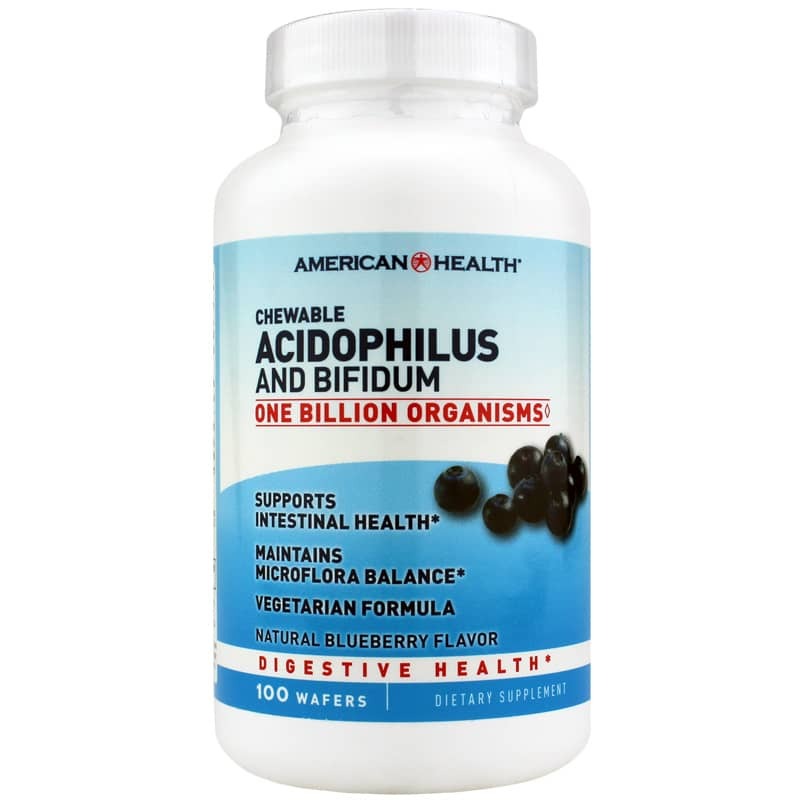 Chewable Acidophilus and Bifidum from American Health is a great-tasting way to maintain daily digestive health and optimal intestinal balance. 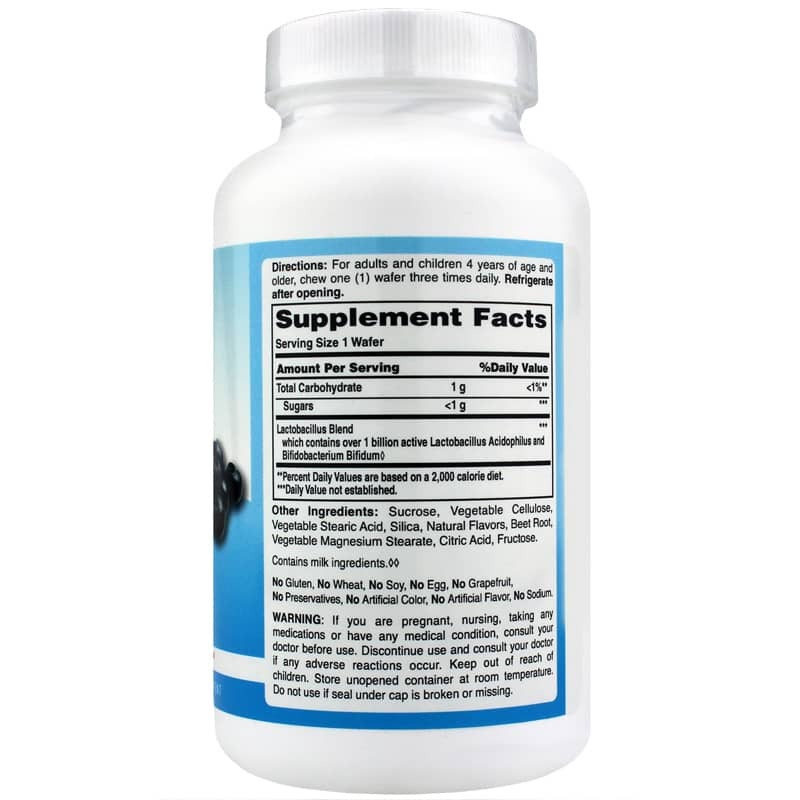 Acidophilus supports the growth of beneficial bacteria in the intestinal tract, helps with proper nutrient absorption, assists in the natural digestive process in the body and contributes to healthy immune function. Acidophilus is the ideal way to help balance our positive flora. 100% natural blueberry flavored Chewable Acidophilus is ideal for both adults and children. Each wafer contains a mix of two classic lactobacilii - acidophilus and bifidum - and is guaranteed to deliver 1 billion microorganisms. * In addition, Chewable Acidophilus wafers are an easy, convenient and delicious way to receive digestive health benefits. With Acidophilus and Bifidum, you can support your digestive health and feel good all day, every day. Other Ingredients: sucrose, vegetable cellulose, vegetable stearic acid, silica, natural flavors, beet root, vegetable magnesium stearate, citric acid, fructose. Contains NO: gluten, wheat, soy, egg, grapefruit, preservatives, artificial color, artificial flavor, sodium or GMOs. **Probiotic cultures are grown in a milk based medium. Milk proteins are later removed and are undetectable in the on-shelf product at 2.5 parts per million. Adults and children 4 years of age and older: Chew one (1) wafer three times daily. Refrigerate after opening.